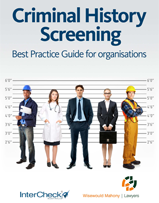 InterCheck Australia provides compliant employment screening services Australia-wide and helps thousands of organisation to streamline their background checking program. The portal is for businesses/organisational use only. If you require less than 5 checks, get started here.